The sensational feel-good musical ‘Mamma Mia!’ will come to the Nelum Pokuna Mahinda Rajapaksa Theatre for an eight-day run from 22-30 December as part of the international tour. ‘Mamma Mia!’ is Judy Craymer’s ingenious vision of staging the story-telling magic of ABBA’s timeless songs with an enchanting tale of family and friendship unfolding on a Greek island paradise. To date, it has been seen by more than 60 million people in 50 productions in 16 different languages. When it was released in 2008, ‘Mamma Mia!’ the movie became the highest grossing live action musical film of all time. A second film, ‘Mamma Mia! Here We Go Again’ had its global release in July this year. From West End to global phenomenon, the London production of ‘Mamma Mia!’ has now been seen by more than 10% of the entire UK population. It is one of only five musicals to have run for more than 10 years both on Broadway and in the West End, and in 2011, it became the first Western musical ever to be staged in Mandarin in the People’s Republic of China. The hugely successful International Tour, since premiering in Dublin in September 2004, has visited 85 cities across 38 countries and sold over five million tickets. With music and lyrics by Benny Andersson and Björn Ulvaeus, ‘Mamma Mia!’ is written by Catherine Johnson, directed by Phyllida Lloyd and choreographed by Anthony Van Laast. The production is designed by Mark Thompson, with lighting design by Howard Harrison, sound design by Andrew Bruce and Bobby Aitken, and musical supervision, additional material and arrangements by Martin Koch. 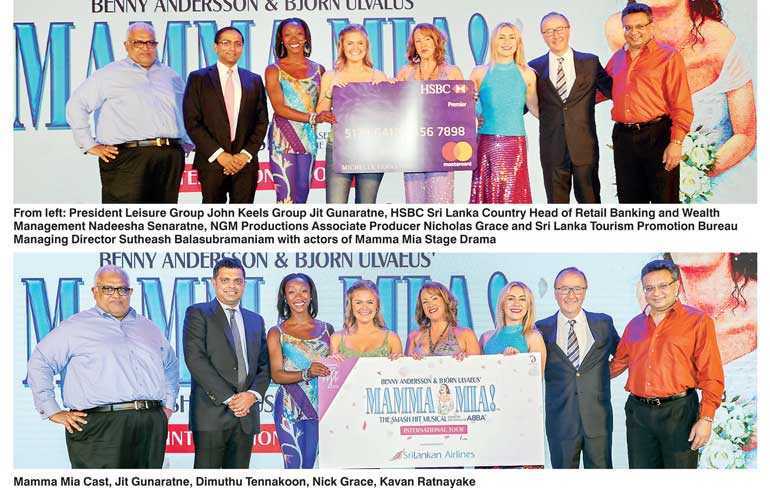 The worldwide smash hit musical ‘Mamma Mia!’ is presented by Cinnamon Life, an integrated development by Sri Lanka’s premier listed conglomerate, the John Keells Group. Cinnamon Life is envisioned to be the epicentre of modern South-east Asia offering an urban escape into world class hospitality, entertainment and lifestyle. This iconic project designed by Cecil Balmond will be a city within a city, and will consist of an 800-roomed luxury 5-star Cinnamon hotel, 427 premium residential apartments across two towers, 295,000 sq.ft of shopping and entertainment spaces, 115,000 sq.ft of event space, a 30 storey state-of-the-art office tower and Signature restaurants. HSBC Premier Customers will have the opportunity to enjoy this much loved musical with exclusive access to the show plus a 15% saving on tickets purchased until 8 August. They could also enjoy rewards redemption through the HSBC Premier Concierge service. The ‘Mamma Mia!’ International Tour is produced by Judy Craymer, Richard East and Björn Ulvaeus for Littlestar in association with Universal, Stage Entertainment and NGM. 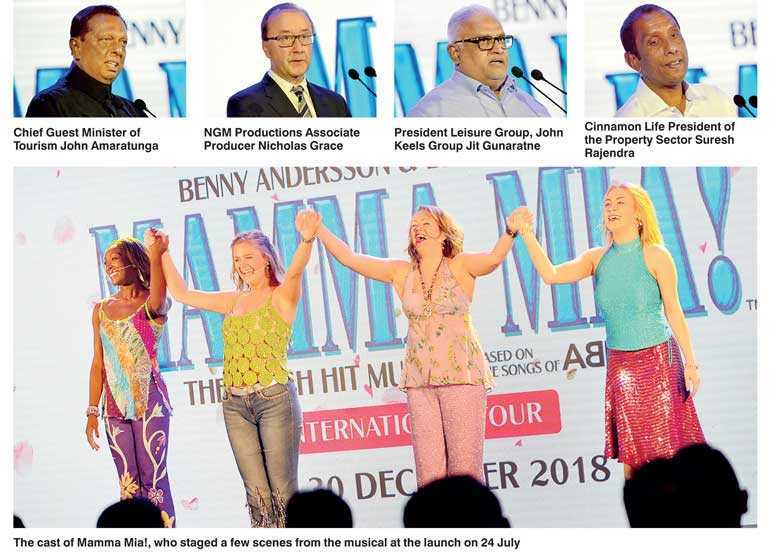 Cinnamon Life presents Benny Anderson and Bjorn Ulvaes’ West End production of ‘Mamma Mia!’ in Association with SriLankan Airlines and HSBC Premier. Banking Partner – HSBC, Conceptualised by Cinnamon Hotels & Resorts, Outdoor Media Partner – Emerging Media, Cinema Partner – Scope Cinemas, Photography Partner – Sagara Lakmal De Mel Photography and Booking Engine Partner Book My Show. Daily FT along with Sunday Times, Daily Mirror Hi magazine, Hi TV, LifeOnline and Daily Mirror Online are the Official Print Media and Web Partners.